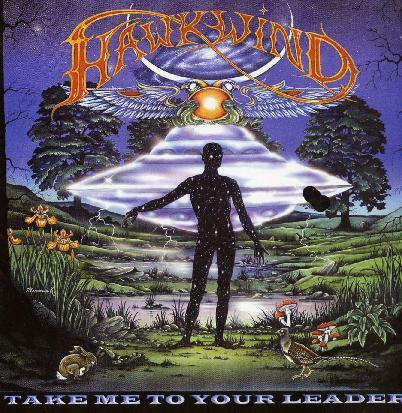 Hawkwind - "Take Me To Your Leader"
Hawkwind have released a steady stream of live and archive releases over the past years but this is the first real full length studio record since Distant Horizons in 1997. In Your Area came out in 1998 and featured 6 new studio tracks as well. I don't count Spacebrock which was released in 2000 as a Hawkwind CD as it was basically Dave Brock studio leftovers, which were unfortunately released as Hawkwind. Anyway, what we have here is 10 really cool psychedelic electronic rock tracks. The CD opens with a reworking of the classic Bob Calvert song, "Spirit of the Age". It features guest vocalist Mathew Wright, who is a radio program host in the UK. It is a great re-working of the old track and more electronic but Dave keeps the very cool and distinctive guitar sound and solo of the past. A really fantastic sound the CD has. "Out Here We Are" is a Alan Davey electronic instrumental piece and is quite nice before it heads into the very heavy and critical of the US song, "Greenback Massacre". This is full on heavy space rock like the stuff on the Bedoiun records or hailing back to tracks like "Sputnick Stan". Alan's voice sure has taken a beating though from doing all the Motorhead cover gigs. He does not sound nearly as good as he did in the past. "To Love a Machine" features Dave on lead vocals and is quite a catchy track with a very psychedelic mix of the guitar, bass and echoed vocals and acoustic guitars, and layers of other sounds are built on top of a cool bass line. The title track is very influenced by house and techno music with the electronic drums and spaced out synths. This leads into "Digital Nation" which features Richard (Drummer) on vocals. His voice is quite unique and I like the laid back groove of this track with flute and jazzy sax. A totally unique song like nothing I have heard before. "Sunray" is next and this is a damn catchy track which features Arthur Brown on lead vocals. He has such a cool and unique voice. While the basic track is quite commercial in nature the track is a hell of psychedelic trip with strange sounds and stuff all over the place. Why be normal?? "Sighs" is a short 1½ minute electronic piece by Alan Davey with strange samples and sounds. Very stoned. This leads into "Angela Android", another song sung by Richard but in a totally different style (a bit too strained). It also features Simon House on violin, Jez Hugget on sax and Lene Lovich as the android. It is a brilliant mix of hard rock and pure electronic. It is totally psychedelic and features some great guitar by Dave Brock. The CD ends with a strange track called "Letter to Robert" which is a spoken word track by Arthur Brown under which Dave and Richard have a little strange jam of sorts. Very strange. A great CD.